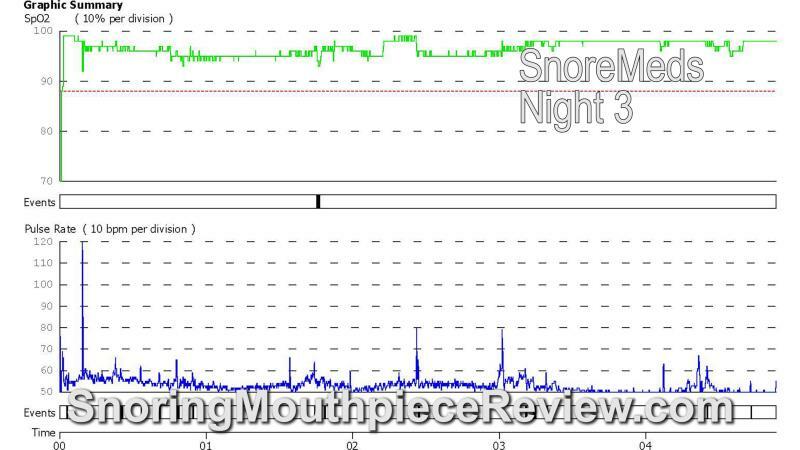 SnoreMeds is a single piece snoring mouthpiece which is designed to reduce snoring while you sleep at night by advancing your jaw. 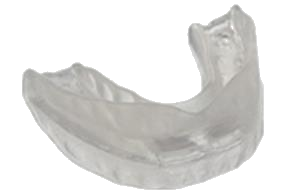 SnoreMeds is a Mandibular Advancement Device (MAD) which means it's a mouthpiece that works by moving the lower jaw forward, using the teeth, preventing the vibration that causes snoring. Snoring is caused by a narrowing of the airway. SnoreMeds advances your low jaw, keeping it from restricting your airway. This reduces snoring. Yes, people snore for different reasons. The jaw drops open at night, or small or collapsing nostrils can prevent you from successfully breathing through your nose. The air hitting the back of the throat causes it to dry, causing the snoring vibrations. A stop snoring mouthpiece helps 85% of people who snore but if you have a nose based problem, nasal strips or cones may be the answer. What's in the SnoreMeds box? Can I wear SnoreMeds be used while wearing dentures? 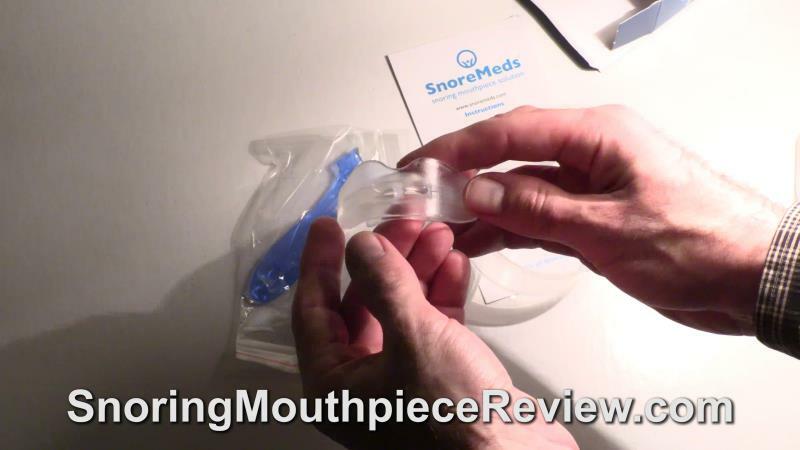 No, SnoreMeds does not recommend using their mouthpiece with dentures. It is also suggested that you have healthy gums and teeth to use the snoring mouthpiece. No, SnoreMeds should not be used by children because their teeth are still in the development stage. What side effects can occur while using SnoreMeds? There are minor and temporary side effects which may occur while wearing SnoreMeds. These include increased salivation and morning tooth or jaw discomfort. Is SnoreMeds cleared by the FDA? No, SnoreMeds has not been cleared by the FDA for the treatment of snoring. How long will SnoreMeds last? 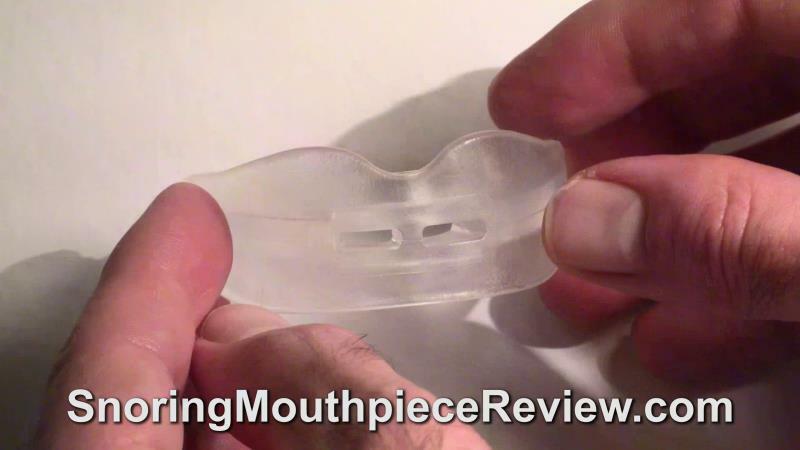 There is no official information regarding the durability of the mouthpiece but it may last up to 1 year. It is highly recommended that the mouthpiece is changed every 3-4 months for hygiene and to ensure the safety of your teeth and gums. Are there different versions of SnoreMeds? Yes, there are two versions, one for men and one for women. The women version is slightly smaller than the regular version. How long does it take to get used to wearing the mouthpiece? It can take up to two weeks for the mouthpiece to feel comfortable wearing at night. During this time, the mouthpiece may fall out sometimes. Can SnoreMeds stop your snoring? There is an 85% chance that the mouthpiece will work for you. If you still snore after the first night, remold the mouthpiece and hold your bottom jaw forward. How much lower jaw advancement does SnoreMeds provide? Using SnoreMeds, you can advance your jaw from 0 to 5 millimeters. The amount of adjustment depends on how the fitting process goes. Does SnoreMeds contain BPA or latex? No. SnoreMeds is BPA and latex free. It's made of a hypoallergic thermoplastic which is approved for dental use. Are there male and female versions of SnoreMeds? Yes. There are two sizes, one is smaller and is for women while the regular size is for men. How do I know if SnoreMeds works for while I am asleep? If you don't have a sleep partner or someone in the room with you, you should use a snoring app to detect your snoring. We have reviewed the top snoring apps here. How wide is the SnoreMeds airway? SnoreMeds has an airway opening of 2 millimeters. This is less than some other mouthpieces. The problem with SnoreMeds is that the airway opening is likely to collapse during fitting, making it not possible to breathe through. 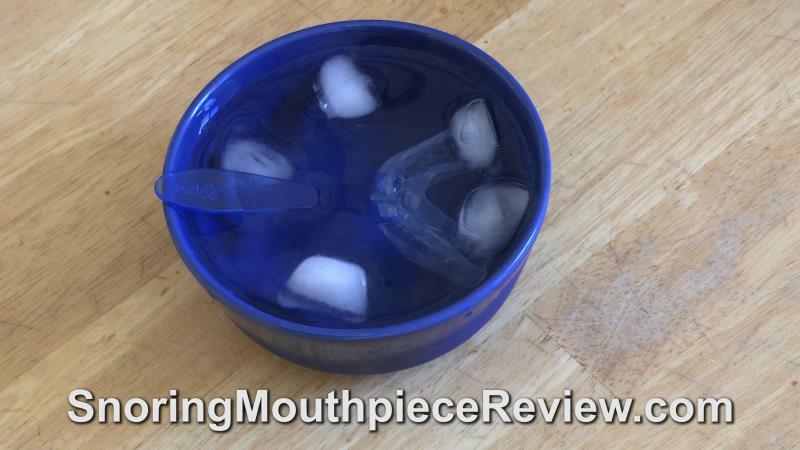 How does SnoreMeds compare to other mouthpieces? 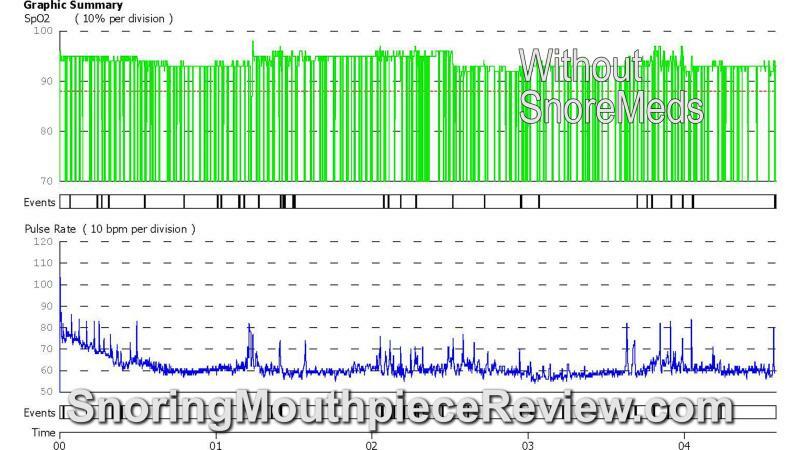 SnoreMeds is a boil and bite mouthpiece which relies on advancement of the jaw through its fitting process, not adjustment settings. This makes SnoreMeds similar to SleepTight Mouthpiece. A patient who snored wore SnoreMeds for four consecutive nights. 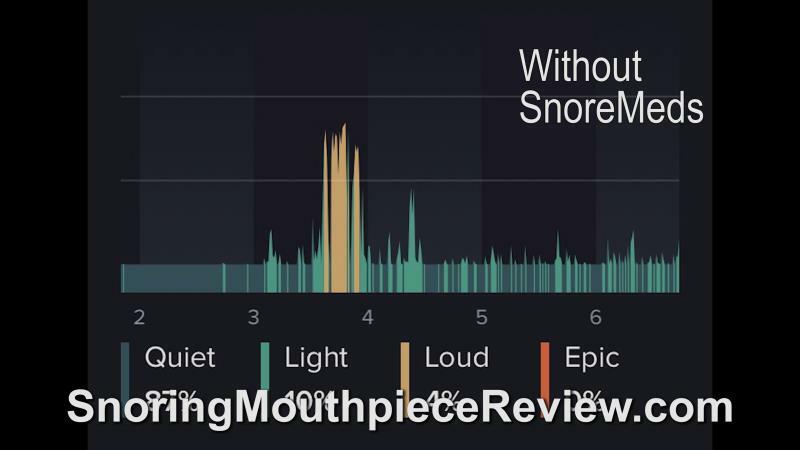 The results, captured using a snoring app. 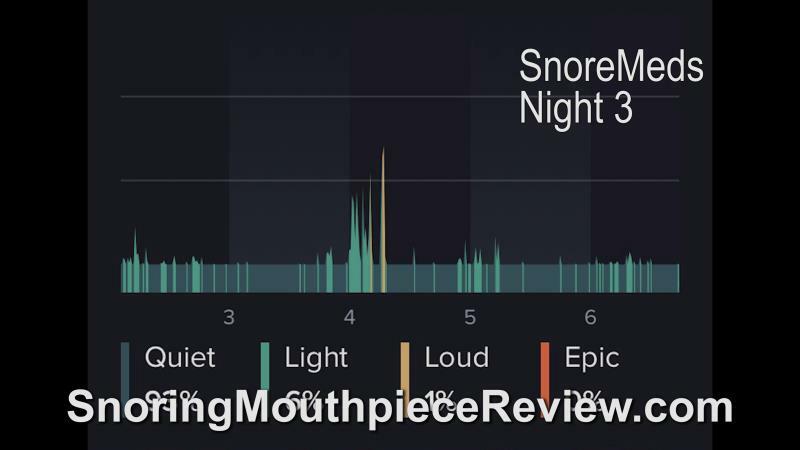 The snoring actually increased the first night while wearing SnoreMeds. 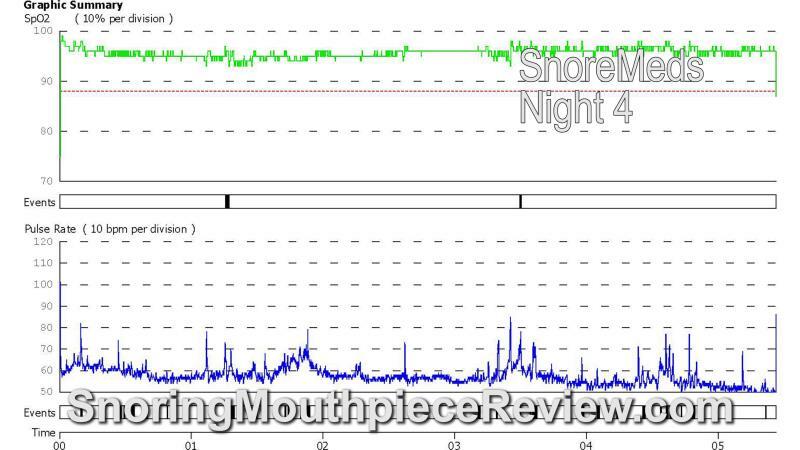 After refitting the mouthpiece to advance the jaw further forward, the following three nights showed a reduction in snoring volume and duration each night. During the time the patient wore SnoreMeds and recorded their snoring, they also measured their blood oxygen saturation using a pulse oximeter to make sure they were breathing properly at night. The following results, recorded with the CMS50E pulse oximeter, indicate that the patient was better able to breathe while wearing SnoreMeds. They were able to breathe even better after making re-fitting the mouthpiece. 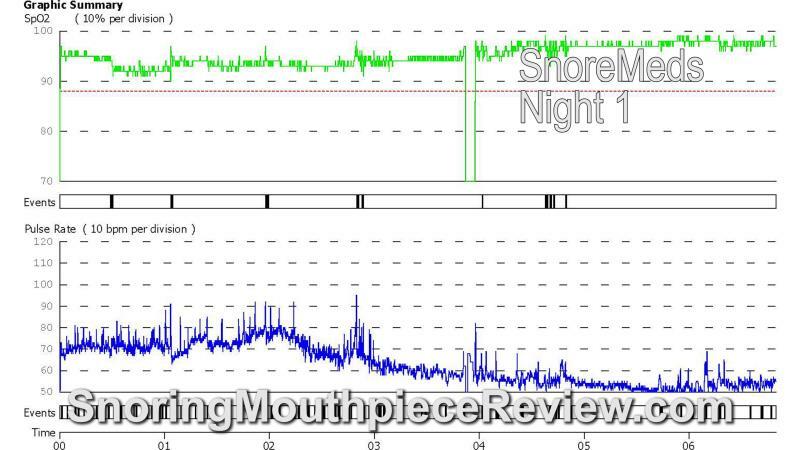 Overall, the patient mentioned mouthpiece was relatively comfortable to wear at night but that it was not as tight as it could have been. 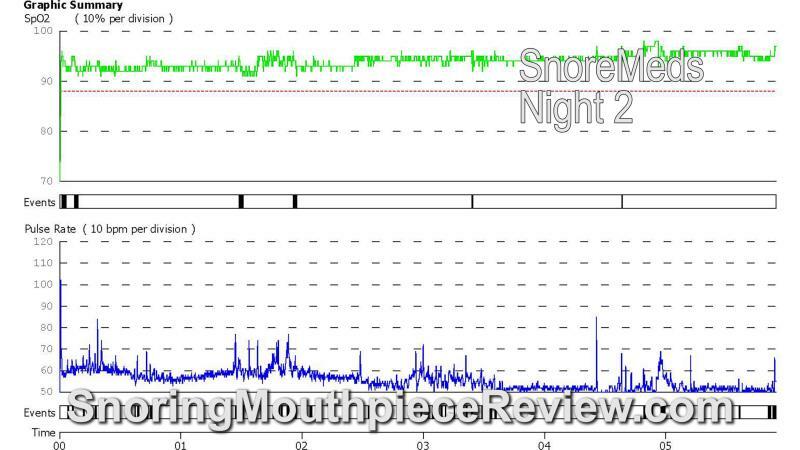 The patient was only able to reduce snoring after re-fitting the mouthpiece. Before fitting SnoreMeds, you need to bring the water to a boil. You put the mouthpiece into the water for 18 seconds by holding onto its fitting spatula. 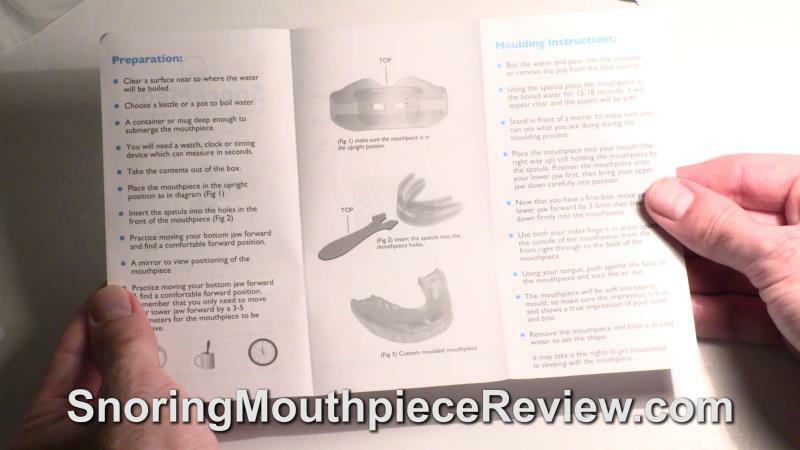 Place the mouthpiece into cold water after fitting it to set the impression. Keep in cold water for 30 seconds. What does SnoreMeds look like after fitting? After fitting SnoreMeds, you should see clear impressions of your teeth on the upper and lower parts of the mouthpiece. The airway may collapse during fitting. This means that you will have to breathe through your mouth when using the mouthpiece. Can I re-mold my teeth impression? Yes, you can re-mold your SnoreMeds teeth impression up to 3 times before the material becomes too soft. What are the shipping options for SnoreMeds? Can you buy SnoreMeds on Amazon or at Walmart, CVS or Walgreens? No, you must buy SnoreMeds from their website. What's the warranty and return policy for SnoreMeds? SnoreMeds offers a 45-day refund to ensure you are satisfied. For a full refund, the product must be in its original packaging. What payment options does SnoreMeds accept? You can order SnoreMeds using PayPal or 2Checkout with a credit card. How do you clean SnoreMeds? You can clean SnoreMeds using the spatula supplied with it. 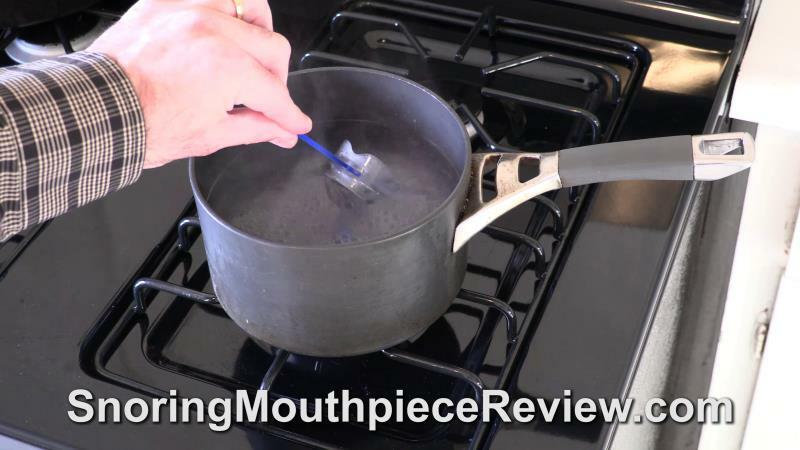 Hold the mouthpiece by the spatula and use a toothbrush with tooth paste to clean it or place the mouthpiece. You can also clean SnoreMeds in a container with a Polident tablet. Additionally, mouthwash can also be keep the mouthpiece clean. SnoreMeds is a single piece snoring mouthpiece that relies on boil and bite fitting to make an impression of your teeth. 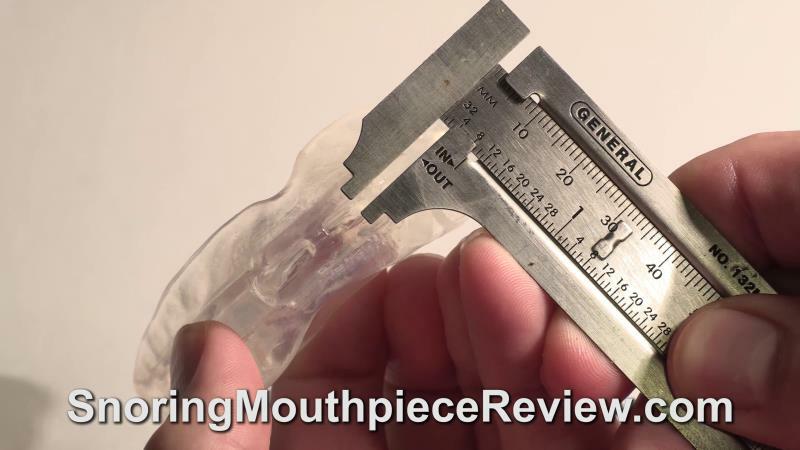 It is important to hold your jaw far forward when fitting the mouthpiece so that it opens your airway. The airway opening for SnoreMeds is small and easily collapses during fitting. This makes it important that you can breathe through your nose when wearing the mouthpiece. 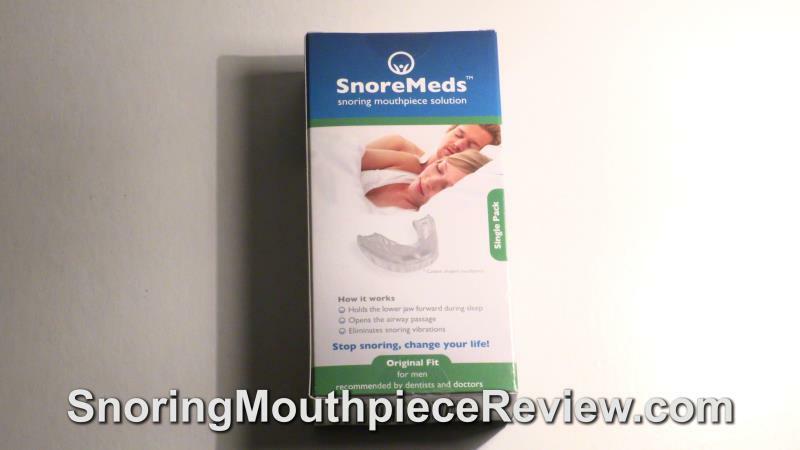 SnoreMeds is lower cost than many snoring mouthpieces. It is not not cleared by the FDA but does use medically safe materials. 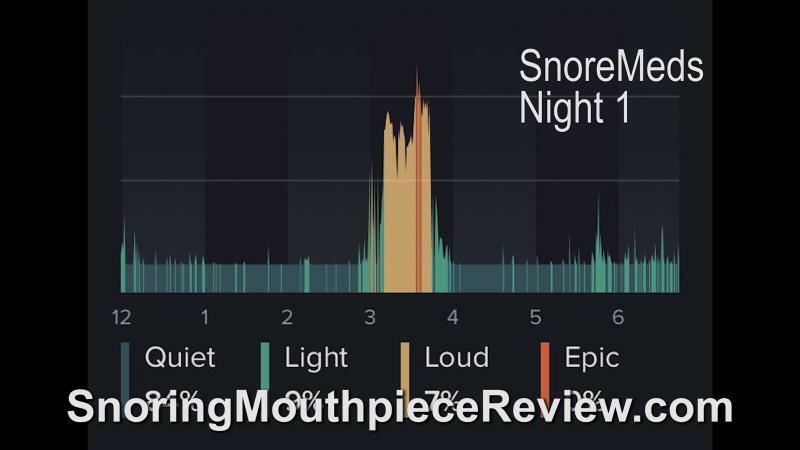 SnoreMeds is best for people with simple snoring, good teeth, who are able to breathe through their nose, and are looking for a low cost snoring mouthpiece. Where can I buy SnoreMeds?